As a disabled person who uses a powerchair one of the most important things in my life is accessibility, the ability to access the places I need to go and do the things I need to do. In an ideal world everyone would be able to go everywhere and do everything regardless of any disabilities but unfortunately we are quite away off that so days like Disabled Access Day are truly important in highlighting the need for better access. This year the day is actually made up of 3 days and is taking place between the 10th and 12th March, this is due to popular demand since the day first began in 2015. The day was created to celebrate good access, something that I really believe is an important thing to do. Of course it is vital that we flag up poor access but I think often companies and places that are getting things right don't get the acknowledgement they deserve. Today I thought I'd share some of my good experiences and some of my bad experiences, because like I said in my opinion it's important to highlight both and the positive and negative. My first experience is something that happened last Summer in St Albans where I used to live. I'd been using a powerchair for a few months after being pushed by someone else in a manual wheelchair for around a year and the new experience really opened my eyes up to a few things. Whenever I'm being pushed in my manual wheelchair I'm often not overly aware of things like small steps, steps that are small enough for my wheelchair to be shunted up. 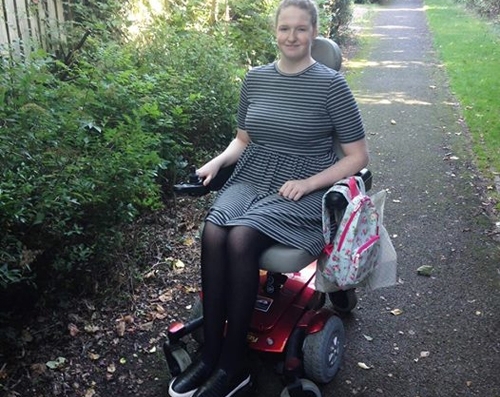 Of course I'm aware in the way that it isn't ideal but as soon as I started using a powerchair I realised that I could no longer get up these small steps and I found myself being shut out of a lot of shops in the town centre. One of these shops was LUSH in St Albans and whilst the shop was small and difficult to get around it was manageable when quiet but the small step to enter the shop was suddenly a huge barrier to me as my powerchair is only basic and I cannot handle even the smallest of steps. Instead of just accepting that I could no longer go in I decided that for once I would do something about it so I highlighted the problem on Twitter and the local store's account soon replied back. We quickly started up an email conversation and their response was one that I wasn't expecting. They quickly put their hands up and owned up to the fact that they hadn't even realised that they were excluding people from their shop. 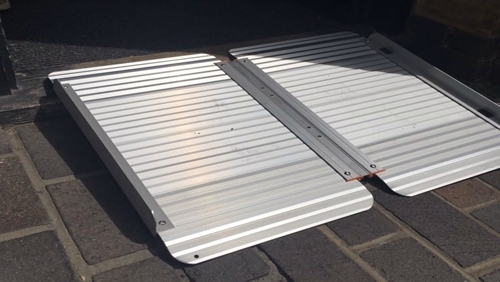 I expected the standard 'we’ll pass this onto xyz team' which is usually signal for 'nothing is going to be done' but within a week they had ordered a ramp for the door. Within a month I was able to enter the store again and when I suggested that they made a sign for the window telling people they had a ramp they said they were already having one made! Amazing! Of course they should have already have had these things in place as shops have to make reasonable adjustments to accommodate disabled people but what impressed me so much was their willingness to do everything they could to help as soon as the issue was brought to their attention. Within a few weeks they got back to me and said they'd had several wheelchair users in already, people who probably had just wheeled past before accepting that they probably wouldn't ever be able to go in. For me it felt like a small battle had been won in the war of disabled access. The lady had tweeted us about our store not being accessible so we asked her to send us her email so we could get in contact with her. Lush is an incredibly inclusive company and the fact that she was disappointed that our store wasn't accessible to her was unacceptable to us so we immediately ordered a fold away ramp to make sure that our store was completely accessible to everyone. It has been a massive help since we introduced it to our store and everyone who has been able to use it has been very appreciative! Of course not every story has a happy ending though and since then I have experienced a lot of access problems in all kinds of places from a NHS building that had 3 steps to enter to big brand shops not having lifts to upper floors. There are smaller everyday problems as well though like cars blocking dropped kerbs and paths which make my life a lot harder and dangerous as it often forces me to go on the road for as far as 100m sometimes. Days like today though encourage conversation and raise awareness of such problems, it's the perfect opportunity to reach out to people who are getting it right and the people who are getting it wrong. I always say, if you don't flag up a problem then who will? We can all do our bit during these few days to change things for the better so do get involved if you can! Tell us about your experiences of accessibility in shops and restaurants. What could businesses do to improve accessibility? Have you ever felt excluded from an event or store? My main problem is the shops themselves having no room to fit my scooter down even the big shops like New Look, B&M and much more my local town center in Erdington I have now given up on actually going out at all. I am currently thinking of sending my scooter back due to the lack of use. Since becoming Disabled I have noticed how many people have a problem with me even being out around town often making comments when they pass me by. In the two years, I have had my scooter I have used it 12 times not enough to justify the amount it costs per month. I live alone and even getting my scooter ready to go to town is very difficult without feeling like I am a nuisance to others who are shopping. And coming back from the shops is a complete nightmare like you have said in the above item so many lowered pavements are blocked by cars parking meaning I have to cross over whilst risking my life. Being also agoraphobic and having the issues that come with that I had hoped having at least a way of getting around without being in agony would help me to slowly regain my confidence, unfortunately, it did the opposite of this. I have not been out shopping since before Christmas and even when I did it was being driven to where I was going and returning the same way. So my life involves me sitting at home spending most of my time alone rarely seeing another person and ordering the items I need online. Three quarters of disabled people have left a shop or business because of poor disability awareness. It's important to remember that accessibility isn't just about ramps. I kind of get the impression they just think about wheelchair users and no other group of people. For me, it's things like actually being able to read the displays and the store not playing such loud music that it physically hurts my ears. I agree @Nystagmite - there is much more to accessibility than just a ramp, there is one store that I won't name but is so dark and the music is so loud! It would be so difficult for anyone with a sight or hearing impairment to shop in there. One of my friends who isn't deaf, once told me he had to walk out of a shop because the music was so loud! As someone with asthma, there's also a serious issue with smell. Certain smells (perfume and the like) can set my asthma off. Some smells are so strong I've got to cross the road to avoid walking pass a certain shop. @Nystagmite I'm so glad to know I'm not the only one who has problems with smells and loud music. Both set off my migraines. All the shopping centres around me blast music throughout the whole centre, not only in the shops. I don't understand the need for it at all.